Where Do Fulltime RVers Vote? Which Are The Best RV Mail Forwarding Services? So, if you’re a fulltime RVer, where do you vote? In the state where I live (Tennessee), this is a very hot topic right now. As you know, you have to claim a permanent place of residence in order to obtain a valid drivers license to drive an RV. 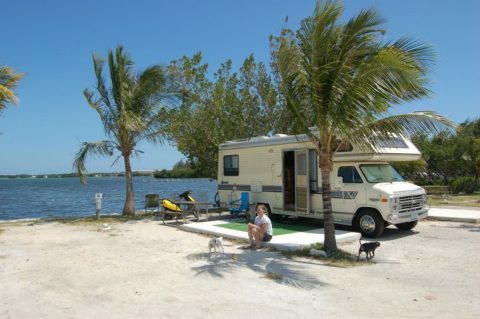 However, despite the fact that many RVers hold a driver’s license and register their vehicles in a particular state, they otherwise have no permanent presence in that state. In Cleveland, Tennessee full time RVrs were kicked off the voting rolls. That’s because people are registering with 3rd party companies to forward their mail to them — yet the RVer doesn’t even have to step foot in the state. Listen to the full story on NPR. A similar controversy arose in New Hampshire. Here’s some of the discussion: Should Non-Resident Taxpayers Get To Vote? UPDATE: RVer’s right to vote restored in Tennesse! If you think this isn’t all that big of a deal or a very important issue, check out how the RV vote affected the 2004 Senate race. How do fulltime RVers choose which state to use for their legal address? How do RVers get their mail when they’re rarely in one place for long? What’s The Best State For RVers When it Comes To Taxes? What About Healthcare & Medical Issues When You’re On The Road? Once you decide on the state that’s best for you, you need to pick an RV mail forwarding service to handle all of the correspondence you receive while you’re traveling. Following are some of the most popular mail forwarding companies that cater to RVers. Take the time to read their helpful FAQs — because you’ll learn a lot about the nuances of registering in those respective states. Mail Forwarding Companies… With A Twist! There are a handful of RV mail forwarding companies that offer a rather unique service to RVers. They will open your mail, scan it, and email it to you as a PDF. You pay a nominal fee for the specific pieces of mail that you want them to physically mail to you. Here’s a simple comparison of RV mail forwarding companies.